Sometimes you just need to give back. So we headed to Los Angeles’ Downtown Women’s Center to buy the ingredients, prepare, cook and serve lunch to over 100 ladies visiting or living at the center. On the menu: oven-baked chicken with crunchy Parmesan coating and lemon zest, white beans, collard greens and baked sweet potato fries (recipe below). We didn’t have to come up with a menu or instructions; the center’s nutritionist on staff, Tracy, handled all that for us. And she was good. Tracy and the volunteer kitchen leader instructed us on how to make theses dishes more healthy and where to find all our tools and utensils. We quickly took over the kitchen! Everything was prepared from scratch using fresh whole foods. The vegetables were simply gorgeous. Fresh vegetable stock was started immediately, to use with the beans and collard greens. We chopped, stirred, boiled, sautéed, zested, coated and seasoned. We smiled and chatted with residents (one in French! ), who were all incredibly grateful. We were too. And everyone was hungry. We were amazed at how talented the staff was, creating such healthy menus and using whole foods, cooking from scratch. The collard greens (using no pork for seasoning) and the baked sweet potato fries were the first to go, and everyone wanted seconds! I highly recommend volunteering at LA’s Downtown Women’s Center — the ladies were wonderful, the day was entertaining and the food was awesome. 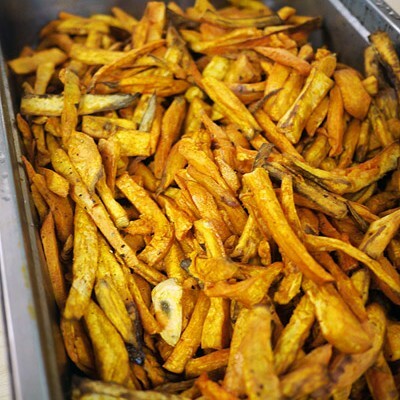 Baked potatoes have a lower glycemic index than potatoes and lots more nutrients, so dig in to these yummy baked fries! 1. Wash and peel the potatoes as shown above (or leave the peel on for more nutrition!). 2. Cut potatoes into half-inch strips. 3. Place on baking sheet, drizzle with olive oil, sprinkle with salt, pepper and smoked paprika, above. 4. Bake at 450 for 40 minutes, or until fries are cooked and slightly crispy. 5. Serve to hungry folks with a smile! Wash and peel the potatoes as shown above (or leave the peel on for more nutrition!). Cut potatoes into half-inch strips. Place on baking sheet, drizzle with olive oil, sprinkle with salt, pepper and smoked paprika, above. Bake at 450 for 40 minutes, or until fries are cooked and slightly crispy. What a wonderful item on the web. And what an admirable and fun afternoon you undertook.